Other Common Names: Curdukotu, hastipippili, hisopo, yanagi-hakka. 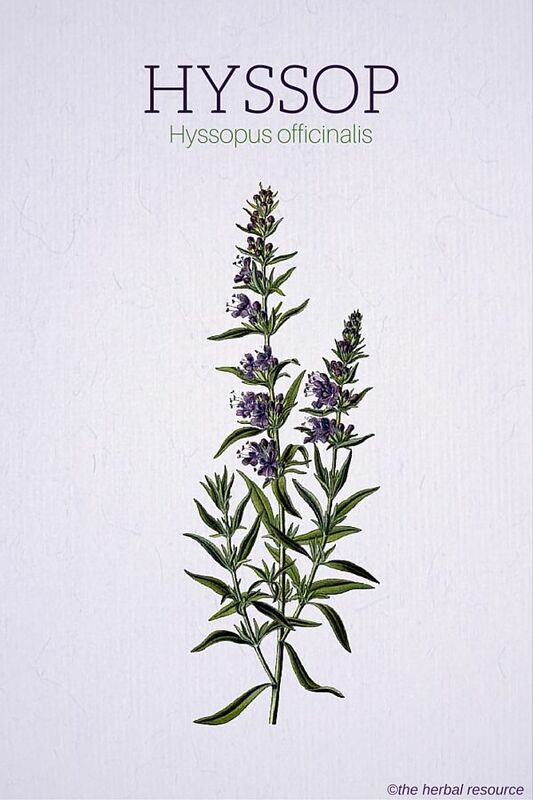 Habitat: Hyssop is native to the Mediterranean countries and temperate parts of Asia but is now widely cultivated all over the world and often used as a decorative plant. Plant Description: Hyssop is a perennial plant from the family of Lamiaceae or the mint family. 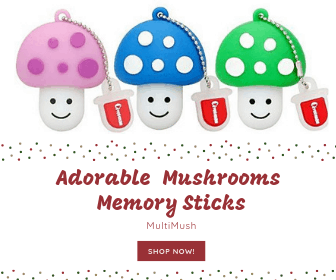 This family contains a wide variety of medicinal and kitchen herbs. Other well-known plants in this family are for example peppermint, basil, sage, lavender, thyme, and catnip. Like all members of the mint family, hyssop has a slender, square stem with opposite positioned leaves and can reach heights of up to two feet. 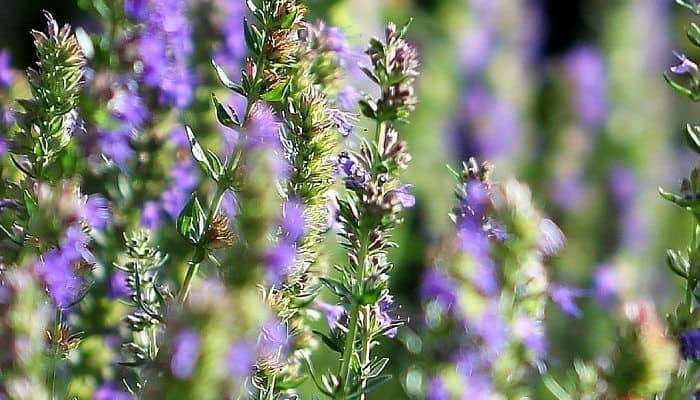 Hyssop flowers from June through October with purple-blue colored flowers that are very fragrant and attract nectar-drinking insects. Some cultivars have white or pink-colored flowers. 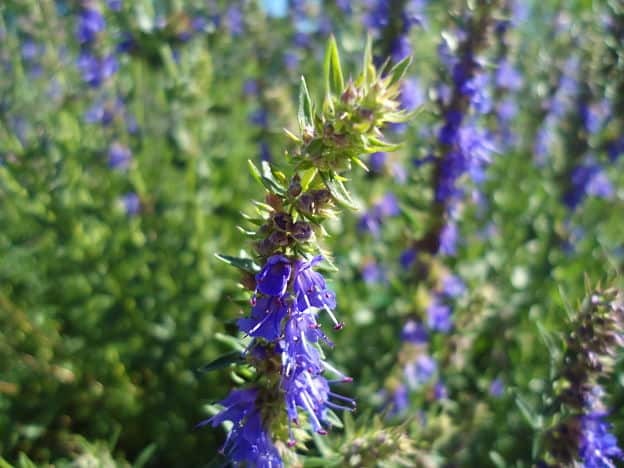 Hyssop leaves and green stems contain many bioactive compounds like rosmarinic and caffeic acids along with pinanones, beta-pinene, limonene, pinocamphone, and isopinocamphone, tannin, glycosides (diosmine), flavonoids, and marrubin. Many of these compounds are found in the volatile oil that can be produced in pure form by steam distillation of the crushed leaves and stems. Plant Parts Used: The above-ground portion of the hyssop plant. 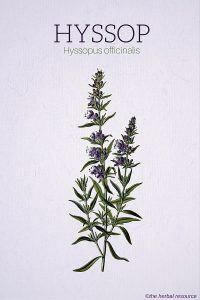 Hyssop leaves can be prepared for medicinal use as infusion, decoction, or poultice. The [easyazon_link identifier=”B004752C4Q” locale=”US” tag=”herbal-resource-20″]commercially available oil[/easyazon_link] can be used internally after dilution or in ointments for external use.